opposite of what is required of me. I had another photo of me standing beyond the line that day. Funny. Try slalom, but not skiing ..
and then you just sit there, using all of your energies not to press it. But you really want to now. If it hadn’t said: Do not press, I’d have been fine. But now, I do. Plus those: Keep out! signs. What are they about? Obviously what ever they are trying to keep us out of is much better than what they are letting us stay out in. Duh. I want to go get some chocolate now. No, it’s about rules and parameters. As Elizabeth states above, it’s always enticing to want to do the opposite of what one is directed to do. The forbidden always attract us! Intriguing! 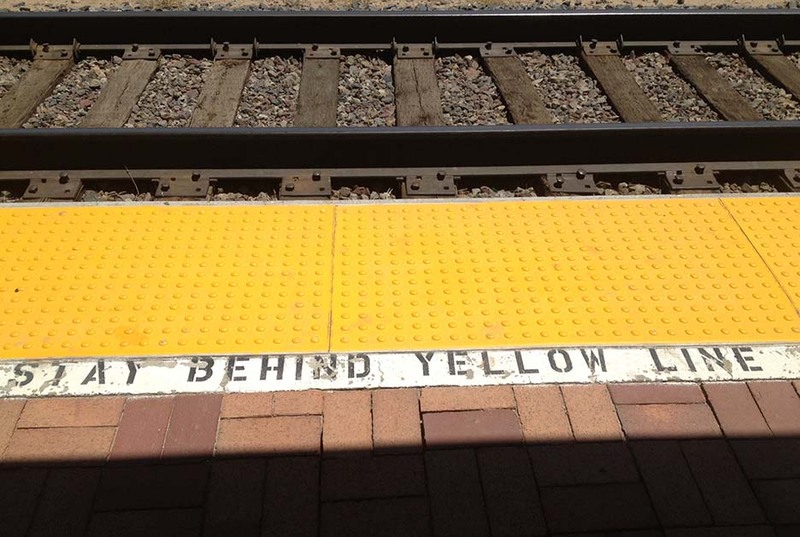 I hope I’m not stepping over any yellow line when I suggest this haiku! Yes, I love it. Thank you. Right. Sometimes it works out, others not so much. Risk worth taking. Well you know, I got down on the tracks and it made for a great photo at the time. Interestingly, I chose to use the one before the line. Because as much as I love harmony, I am and forever will be a rebellious and willful spirit. My husband says that “rules are in place to control the fun” and we laugh at this silliness. But he’s totally serious. And, I love him for it. It’s good that we’re all different and that rule followers and run benders can live happily together. If you run off like that – then you have to stay with me and hold my hand! I’m pleased to see that you were standing on the right side of the line when you took the picture. Life does indeed come around!